Ice House America is a preeminent manufacturer and operator of automated ice vending machines. As a leader in the industry, they have revolutionized the way small businesses and consumers purchase ice and water in bulk. Their unmatched technology improves product quality and increases cost efficiency while also reducing the carbon footprint. Their primary product is a large, permanently installed vending machine that can supply fresh water by the jug and drop ice into bags filled on-site or bulk vends into your own cooler. They’re about the size of a small RV and they are pretty awesome. Ice House America has been a leader in the design and manufacturing of ice and water vending machine products. 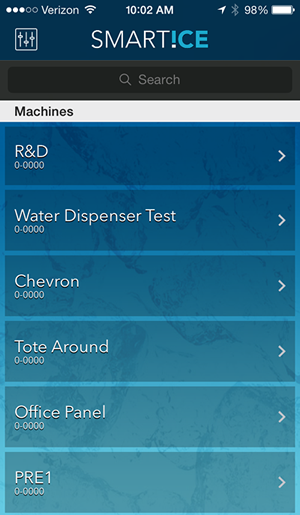 As the business grew and thousands of ice machines were positioned around the United States there was a growing need to get real time insights from machine activity. Ice House America was facing tremendous market pressure to provide a first-party OEM solution, and Web Ascender was brought in to make that happen. Our team spent a week in IHA’s headquarters in Jacksonville, Florida and their manufacturing facility in Moultrie, Georgia where we learned more about their business and outlined the initial product features. The Web Ascender team then continued working from our headquarters in Okemos, Michigan and communicated frequently with IHA stakeholders via phone, email, and web conferences. IHA outfitted all of the vending machines with cellular data cards that would allow the machine to receive commands and upload data remotely. 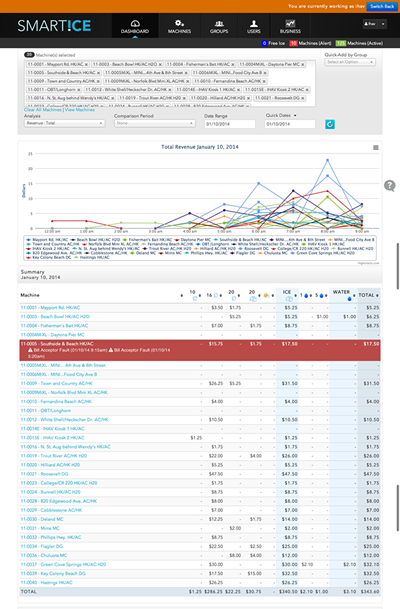 Web Ascender launched version 2 of the SmartIce Web Application which greatly expanded the amount of data that can be collected and analyzed to provide insights into machine operations, durability, and sales performance. The revamped web application allows owners and operators to see a real-time data stream of vends and other information to know what their machine is doing at any given moment. They can see how much money the machine has collected, how many bags are left, when the water filters need to be replaced, ice maker production levels, and dozens of other operational metrics that can be used to remotely troubleshoot machines and ensure their peak operation. Owners and maintenance staff can subscribe to over 30 different alert notifications to be notified of significant events in real-time. 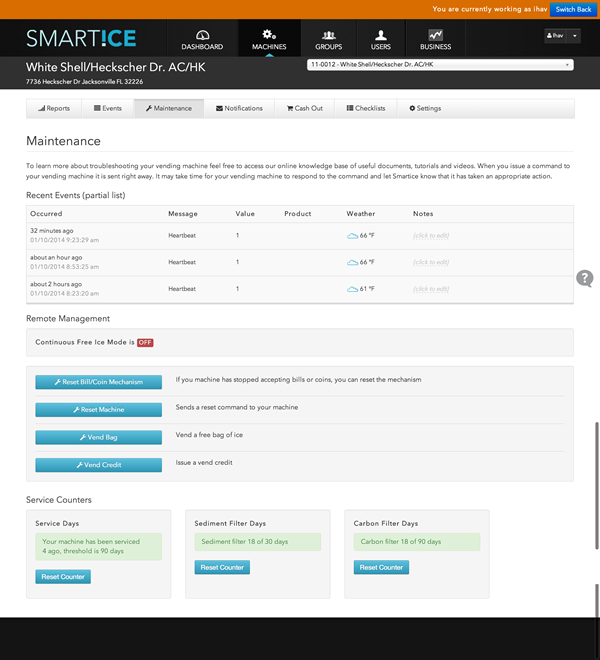 Operators can even vend a free bag of ice remotely if a customer calls the support number with an issue. The most recent addition was integrating the web application with video surveillance cameras. Cameras have been mounted inside and outside the machines to give owners real-time video feeds of their equipment, ice levels, and secure cash areas. Web Ascender designed the web application to work well on all modern mobile devices. 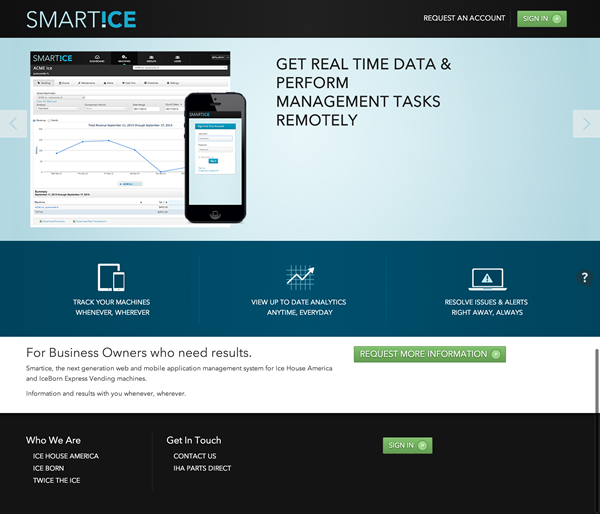 In fact, over 75% of SmartIce users access the web application solely from their mobile device. However, there was a need to make some very specific features available via a native mobile app, with some offline requirements. 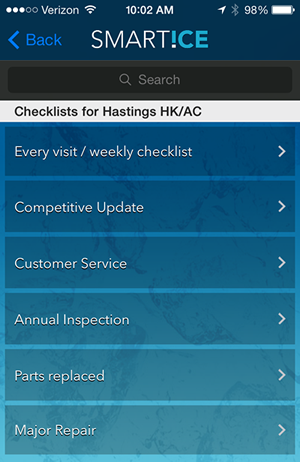 The main function of the SmartIce mobile app is to give owners and maintenance staff the ability to go through a series of checklists when they visit their machines. This includes routine maintenance items as well as general external housekeeping items like making sure the machine is clean and presentable. 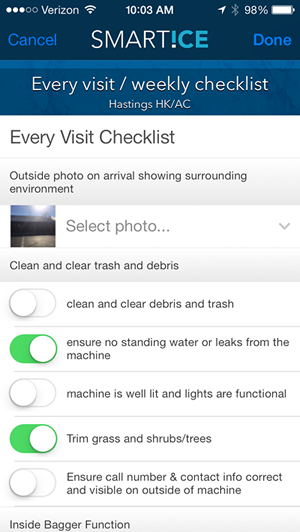 All of these checklists can be completed without an internet connection and the mobile app will sync (upload) checklists and photos of any pertinent information back to the central SmartIce web application when an internet connection is available. Ice House America saw a 100% return on their investment within 10 months. The new technology put both their vending machines and their software companion products ahead of the competition. Web Ascender’s “Launch + Growth” approach provides Ice House America with an ongoing partner to help them design, develop, and deploy new features to production within 2 – 4 weeks, giving them the ability to stay #1 in their industry.